Early “frost out” and below average Winter snow depths leading to crunchy dry trail conditions were supposed to be this years headline until “hot” weather and runners stole the show. “Hot” in the North only means high 70’s but when that is the first warm weather of the year you have raced in, it can feel downright oppressive especially when the course is stifling to begin with. The last couple of years the weekend before Memorial Day weekend better known in Northern ultra circles as the Superior Spring Trail Race Weekend has seen its fair share of late snow pack and corresponding wet and sloppy trails. Good omens were presented in the weeks prior as we cleared and readied trails after a typical long hard Northern Winter as even the lowest and muddiest spots that sometimes never fully achieve dry were already well on their way in early May. For the first time in the races history, this years starting field was chosen via a lottery – the decision to switch to this format not made lightly by the race committee with the action being taken to ensure the fairest possible means for selecting the starting field and to make possible a continued safe, fun and sustainable event as popularity continues to grow year after year. 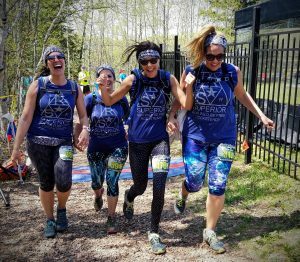 The field that was chosen represented 15 states and Canada and a plethora of talented runners including young, old, new and veteran trail lovers alike. The men’s 50KM was slated to be the most competitive race of the day but after some “real life interventions” on race week (nothing serious mind you) would keep course record holder and four time winner (and once second) Chris Lundstrom at home, leaving Chris’s of late most capable challenger Michael Borst a near shoe-in for the win, and yes, even on a course as difficult in a sport as unpredictable, Borst’s pedigree giving strong inclination of the result to follow. As expected Borst was without equal competition on the day, sneaking in under 4 hours and even with awesome trail conditions the heat may have robbed him of a few additional minutes – upon finishing in 3:57:32 all Borst could say was “how does he do that” in reference to Lundstrom’s still standing course record of 3:48:54. All of this fanfare about young Borst is not to infer that there was no worthy or talented competition, but up until now Borst (Lundstrom and a few other locals) have been in a bracket just above athletes that most other runners routinely idolize. One of those runner, Mike Ward of Duluth Minnesota finished up with a solid 4:23:06 making him the Open champion and 2nd overall – notably his mother and dedicated Rocksteady Running volunteer Julie Ward won the Grand Masters title in the 25KM race – oh, genetics how we love you! Mike was followed by Luke Nelson of Anoka, MN with a 4:38:06 – the top 9 men all sneaking in under 5 hours which is very solid on this challenging course. On the Women’s side it was tough to pick an early favorite but Laura Albares of Hastings Minnesota made the RD proud (who is also from Hastings) as her name was called out as she crossed the line as first woman with a 5:17:08 putting her in 17th overall when combined with the men. Second place was Masters Runner Jody Zeleznikar of Esko, MN and third went to Kelly Jaworski of Excelsior, MN. Other notable performances in the 50K included a new record for youngest Superior 50KM finisher by 16 year old Sarah Schmidt-Dannert with her mother Claudia Schmidt-Dannert hearing the news that she had won the Grand Masters title as they crossed the line together. Steve Hagedorn of Two Harbors Minnesota finished his 9th Superior 50K, tying him with Maria Barton for most Superior 50KM finishes since the races inception in 2003. Our oldest finisher in the 50KM was trail OG Brian Landstrom of Duluth, MN, 64 years old. With the 50KM not panning out as the showdown that everyone anticipated the men’s 25KM made up for it with some fast and close competition with Adam Doe and Michael Peterka running nearly stride for stride to the half-way mark. From there a battle ensued and the aptly named new local trail phenom Doe bounced along to another season win in 1:55:14, the aforementioned Peterka taking second and Brooks Grossinger taking third – the first two finishing under two hours and the third before the clock rounded 2:01 – taking a moment to back-track and justify the singing of Borst’s praises in the 50KM race, it should be duly noted that Borst ran the equivalent of two 1:59’s to achieve that 3:57:32 and sub 2:00 for the 25KM is a feat in itself! The Women’s race played out nearly identical to the men’s with Emily Gordon and Katylyn Stout hitting the half way mark together – not far behind watching 1 & 2 disappear out of the aid station and up the trail for the return trip was Heidi Skildum, she was caught admiring and singing praises of the woman in fourth charging hard into the aid station after her – this the personification of the sport… competition but never over camaraderie! In he end, being the talented runner that she is, Heidi charged and remained in it to place third woman with Stout taking second and Gordon taking first. Our woman’s 25KM champion Emily Gordon recently left a budding post-collegiate / professional road racing career to pursue her passion of trail running and we were honored that she chose the Superior 25KM to debut at. She did so to great effect – besting the previous CR of 2:10:45 with her stellar 2:05:12 – again, fast trail conditions likely somewhat mitigated by the first perceived hot day of the year – we expect big things from Emily Gordon in the future. Also of no lesser note in the 25KM was oldest finisher of race weekend David Huberty, 72 years young earning his 8th Superior 25KM finish. For the youngsters we had the son of frequent RSR runner and volunteer Timothy Owata, Ethan Owata complete the 25KM at the ripe young age of 12. Gwen Schroeder, 13 finished up another one with her mom, she ran her first Superior 25KM at the age of 10! We have often said that our event is put on by trail runners for trail runners – more accurately we should probably state that our events are put on by trail people for trail people. I have always maintained that trail runners run trails and trail people not only run trails but they volunteer on trails, volunteer at races, make donations and become members of trail associations (think Superior Hiking Trail, North Country Trail, Ice Age Trail). We could not be more proud of our core group of runners and volunteers that are real deal trail people. As you bask in the glory and experience that was the Superior Trail Race, I issue this challenge, if you are not yet a member of the Superior Hiking Trail Association, please consider becoming a member HERE and when you do join, please also drop them a note HERE, tell them that you ran the Superior Trail Race and tell them that you support the Superior Hiking Trail and you support the Superior Trail Race and the circle will be complete! Thank you all again for being a great part of the Superior family, the Rocksteady family and part of our Northern trail running community. Run wild and be free!